My Thoughts: Lovely. Just lovely. From the authors note in the beginning to the final page this was a book with a message. Ms. Coble shared in her author's note at the beginning of the book that a part of her manifested itself in Lucy. Lucy has major control issues. MAJOR. But I could see why, and I could feel the weight on her shoulders almost as if it were my own. Perhaps it's because I too rely on myself instead of given my burdens to the Lord. I enjoyed most of the characters in this book. Nate's brother was underdeveloped for my taste. I would have liked more on where his emotions were coming from so I could better understand those family dynamics. There were a few pieces of character information here and there that again, I wished were fleshed out a little better. There were also a few times I think I audibly moaned from frustration with the actions of the characters. That said, I learned something. And aren't we always better when we discover something new about ourselves? This author I think tends to do a good job, at least in the handful of books by her that I've read, of not being overly preachy as some Christian authors can be. But this struck a good balance of faith, humor, romance and mystery. Would I Recommend This Book? Absolutely. I really enjoyed this book. My copy had some printing issues which was a little frustrating. But I was able to get around them. I read this book in less than a week. Which, right now, for me is great. There were a couple nights I stayed up later than I should have because I wanted to see what happened next. I wanted Lucy to trust. To trust Nate. But more importantly to trust the Lord. To relinquish some of that control and see where that would take her. And in the end, it forced me to take a look at my own life. I would rate this book 4/5 stars (it's a bookshelf, re-read someday sort of book). There was a reader's guide at the end of the story for those who are interested in further thought, or a book club discussion. 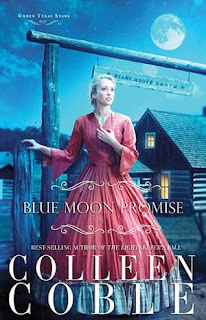 Check out the Blue Moon Promise Blog Tour! This sounds like a wonderful read. I'm always looking for easy, flowing reads that don't require too much thinking/analyzing. I do enough of that with school books.